Consumer response has been overwhelmingly positive for the next generation of whole-home DVR that DIRECTV introduced to consumers across the U.S. in October, according to Alan Smith, Senior Product Manager at the satellite giant. To maintain momentum, DIRECTV will soon introduce a second generation of the Genie whole-home solution, while the RVU Remote User Interface technology that makes the service possible is about to get another boost. The Pay TV operator has evolved its whole-home DVR offer into a server/client architecture that enables customers to enjoy HD DVR services on up to eight televisions using just one DVR gateway. You can enjoy HD DVR functionality on four televisions simultaneously, including the TV connected to the Genie DVR server. This is one of the most advanced whole-home DVR systems in the world and is particularly notable because DIRECTV is pioneering the use of open CE devices with its DVR server. The system harnesses DLNA and the RVU Alliance RUI (Remote User Interface) technology to make the server/client architecture possible. RVU RUI enables the pixel accurate reproduction of the operator UI on any compatible device and achieves complete consistency in the look-and-feel of the Pay TV service across those devices. This is important for operators who would like to use connected TV devices as a way for customers to watch Pay TV services in more rooms without having to ship an STB (even a thin client STB) for each TV screen. The Genie whole-home solution harnesses DLNA Premium Content Guidelines, making DIRECTV one of the first Pay TV operators in the world to deploy this technology. DLNA Premium Content Guidelines include DTCP/IP to encrypt video for transmission over a home network to multiple CE devices and enforce rights that are defined by the service provider CAS/DRM. 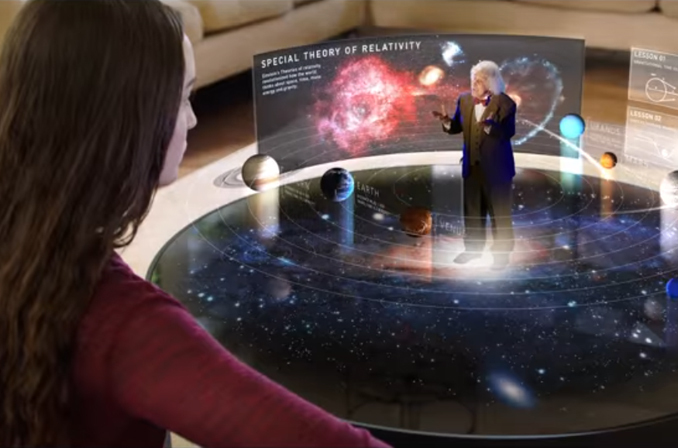 The presence of the Sony television in this demo heralds an expansion in the number of client devices that will work with the Genie DVR server. Sony will support RVU RUI on some of its 2013 Smart TVs and perhaps more importantly, on the Sony PlayStation 3 games console. Select Samsung 2011 Smart TVs were the first to support the RVU RUI specification, with all their 2012 Smart models recently receiving an update to include RVU functionality. All Samsung 2013 Smart TVs will support RVU out of the box. The Genie Mini is the default client today, shipped with the Genie DVR gateway to customers, but some consumers are already connecting their Samsung Smart TVs to the whole-home system. With more clients available the trend towards using CE devices on the end of the whole-home network will accelerate but Alan Smith does not view connected TV devices as a replacement for set-top boxes, but rather a complement. 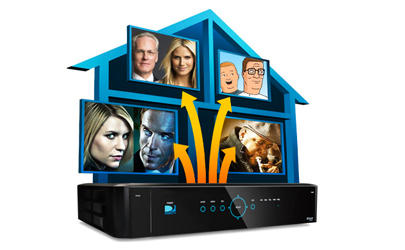 DIRECTV will soon introduce a new generation of hardware for the Genie whole-home DVR solution. The new C41 Mini Genie STB provides new RF remote control technology. The new HR44 gateway/server utilizes the advances in processing power that have arrived while the current HR34 server was under development. More powerful, it provides faster response times for consumers. It is also smaller than its predecessor. The new DVR server design has improved heat expulsion to the point where the internal fan is almost redundant. The fan remains but will only be called upon in exceptional circumstances. 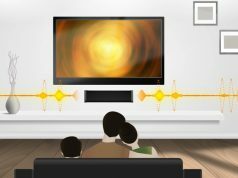 The company takes energy efficiency seriously and won its third ENERGY STAR award (from the US Environmental Protection Agency) in March, partly because of its move towards giving consumers a receiver-less option for whole-home TV. DIRECTV is one of the pioneers and champions for the use of RVU RUI technology and Alan Smith believes other Pay TV operators will follow its lead. DIRECTV PanAmericana and Sky Mexico both joined the RVU Alliance recently, joining DIRECTV and Sky Brasil as the Pay TV operator members. â€œThe more people are using this, the more it demonstrates to other Pay TV operators that this is something that delivers the kind of interoperability they need and which can be deployed quickly,â€ says Smith. He believes the RVU Allianceâ€™s approach to Remote User Interface will gain more traction because it is available today and it is now a proven technology, working in the field, stable and with happy consumers enjoying its benefits in DIRECTV homes. RVU RUI is now part of the DLNA Interoperability Guidelines as well, meaning the technology can be used by DLNA certified products, as witnessed in demonstrations at CES recently and at IBC last year. RVU Alliance has now ratified the second generation of RUI, the RUI 2.0 specification. Whereas version 1.0 supports bitmap graphics, v2.0 adds vector graphics commands and this improves the performance possible on RVU clients. It also makes it easier for third parties to develop RVU client devices. The RVU 2.0 specification is backwards compatible with RVU 1.0.